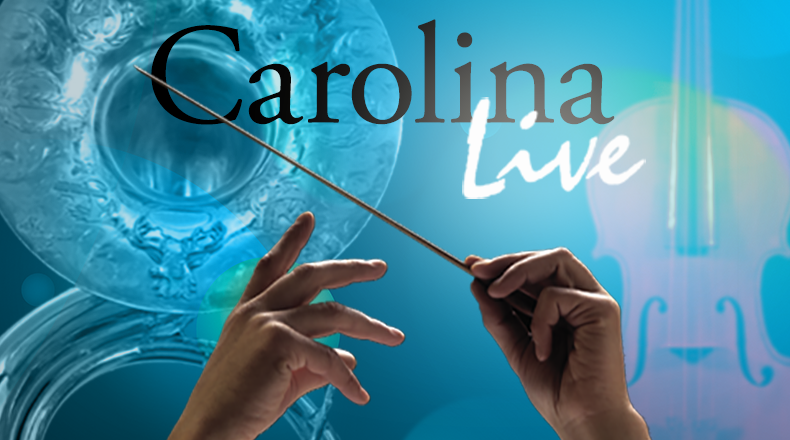 Carolina Live is a weekly program of the Carolinas' best live classical concert recordings. Presented by OrthoCarolina, the show is a co-production of WDAV 89.9 Classical Public Radio and South Carolina Public Radio. Longtime classical music announcer Lauren Rico hosts the series. Several of the greatest figures in Russian musical history provide the selections featured in this edition of Carolina Live. The concert's title is The Rite of Spring, and that groundbreaking work by Igor Stravinsky is performed by the South Carolina Philharmonic, which also presents a Suite from Cinderella by Sergei Prokofiev. The music begins with Modest Mussorgsky's Night on Bald Mountain, in a re-orchestration by Nikolai Rimsky-Korsakov; that's played by the South Carolina Philharmonic Youth Orchestra. It's powerful music for any season on Carolina Live. Enjoy music from two concerts by the Greenville Symphony on this Carolina Live. The Chamber Orchestra offers a fascinating group of selections from the concert Chamber Extravaganza—music by Korngold, Nino Rota and Kurt Weill. Then the Symphony plays two highlights from an Oktoberfest concert—Carl Maria von Weber's Symphony No. 1 in C and Richard Strauss' Le Bourgeois Gentilhomme. There's wonderful variety to be found in this Carolina Live, so make sure to join us. Schubert & Mozart is the title the Winston-Salem Symphony bestowed on the concert we feature this week, but it must be noted that another excellent composer contributes to the music—Benjamin Britten. Guest conductor Mark Stringer leads the orchestra in Schubert's "Unfinished" Symphony No. 8, Britten's Concerto for Violin & Viola, and Mozart's final symphony—No. 41 in C, "Jupiter." It's a program of variety and exciting performances, so be with us for this edition of Carolina Live. Three great "B's" are featured in this Carolina Live. Johann Sebastian Bach is represented by his beloved Jesu, Joy of Man's Desiring; Johannes Brahms' Piano Concerto No. 1 in d-minor features a marvelous guest pianist; and Beethoven is on hand with his stirring Symphony No. 7 in A. The music is presented by the Greensboro Symphony Orchestra and conductor Dmitry Sitkovetsky, so join us for their concert German Romantics. Classical fans often turn to their favorite music for inspiration, and on this Carolina Live we have music to provide just that. Inspired By the Classics is the title of a concert from the Greenville Symphony Orchestra's chamber series, and there are works from Richard Strauss, who was inspired by Francois Couperin, from Sergei Prokofiev, inspired by Haydn and Mozart, and from Tchaikovsky, who also found his muse in Mozart. In addition, the Davidson College Choral Arts Society and Pro Arte Orchestra present a moving performance of Dan Forrest's Requiem For the Living. The combined forces of several Davidson College choirs and orchestral ensemble present a powerful contemporary mass by Welsh composer Karl Jenkins on this edition of the program. Then it's off to Greenville for highlights from a concert featuring tasty selections by Jacques Ibert, as well as an opening memorial tribute to beloved orchestra leader Sherwood Mobley. On this Carolina Live you can enjoy a concert by the South Carolina Philhamonic featuring an interesting combination of musical textures. It begins with Banitza Groove! by Japanese-born composer Dai Fujikura, then shifts to the power of Beethoven's Piano Concerto No. 4 in G. The concluding work comes from a marvelous symphonist, Jean Sibelius—his Symphony No. 2 in D. Enjoy the diversity of the selections and the consistency of the performances on Carolina Live. A bright, rising star joins conductor Robert Moody and the Winston-Salem Symphony for this concert of Russian masterworks. Rachmaninoff's most technically challenging piano concerto is the centerpiece while works by Rimsky-Korsakov and Stravinsky provide the bookends. Conductor Edvard Tchivzhel and the Greenville Symphony Orchestra focus on Ludwig van Beethoven in the concert featured on this program. From the great composer comes his Egmont Overture, the Piano Concerto No. 5 with guest artist Dmitri Levkovich and the always-stirring Symphony No. 5 in c. The concert's title is Beethoven the Great and the orchestra does a great job of playing the master's music! The massed Choirs and Pro Arte Orchestra of Davidson College, along with impressive vocal soloists, team to present a major work by Ralph Vaughn Williams—A Sea Symphony. It's a spectacular choral symphony by the English great, not heard all that often. You can hear it on this Carolina Live, along with a set of highlights from Tchaikovsky's Swan Lake ballet, played by Hickory, North Carolina's Western Piedmont Symphony. There's a wonderful combination of chamber charm and symphonic power on this edition of Carolina Live. The Tesla Quartet provides a concert from their time as resident quartet with the Western Piedmont Symphony, with pieces by Mozart, Sibelius and Kevin Puts. Then the capper on the program is the entire Pictures at an Exhibition by Modest Mussorgsky, with all the beauty and drama the work contains. Join us for both kinds of musical magic on this program. Mozart is indeed the focus of this energetic concert by the Greensboro Symphony Orchestra, and the masterful composer's diversity is highlighted. Dmitry Sitkovetsky leads the orchestra in the overture from Mozart's opera The Magic Flute, the Flute Concerto No. 1 in G major isplayed by guest artist Debra Reuter-Pivetta, and Mozart's Symphony No. 39 in E-flat major is the closer. A rich sampling of Mozartiana on this edition of Carolina Live. Haydn: Symphony No. 82 in C "The Bear"
We combine the grandeur of symphonic music and the beauty of a grand choral work on this Carolina Live program. Respected conductor John Gordon Ross leads the Western Piedmont Symphony in a fun concert titled Classical Critters, featuring music by Rimsky-Korsakov, Haydn and Prokofiev. Then a combination of three choirs come together to perform John Rutter's superb Requiem in Anderson, SC. It's a strong combination, so make sure to join us. The concert featured on this Carolina Live program was titled Oktoberfest, but it's filled with music that's wonderful any month of the year. You'll hear Weber's Overture to Der Freischutz, the Schicksalslied (Song of Destiny) by Brahms, Beethoven's "warm-up" to the 9th Symphony, his stirring Choral Fantasy, plus Mendelssohn's powerful Symphony No. 5 in d-minor. It's a full and appetizing menu of musical delights, just right for whenever you may hear it.